KLEIN BONAIRE - BONAIRE, N.A. Dive Journal: In the morning, we're diving again - of course - this is Bonaire! We've scheduled to dive with the Sand Dollar I and our divemaster is again Joao. Myron and I note that Joao's girlfriend is wearing an engaging thong bikini. This morning we are diving again off Klein Bonaire at a site called Monte's Divi, so named since the site is marked by a lone divi-divi tree on the small island's south side beach. We've learned what every diver learns on Bonaire - there is no need to use the dive boats except for the dive sites off Klein Bonaire. All others are easily accessible from the shore! The Sand Dollar I is a much smaller boat than the Sand Dollar II and it is not equipped with a rear dive platform or ladder. Entry into the water involves doing a back roll over the transom or gunwales, preferably in synch with another diver to minimize boat roll. Mercedes and Linda don't like this procedure, but handle it very well. The dive site is gorgeous. We descend rapidly to nearly 100 feet. My ears are clearing slowly this morning, but with some patience I make it down. The bottom here goes to about 110 but we decide to stay above it, and examine beautiful gardens of elephant ears "sprouting" from the reef at this depth. Linda and I stop at several sites to observe Pederson's cleaner shrimp in action, who act like service station attendants for big fish in need of some catharsis. We also identify a corkscrew anemone at this site. In shallower waters, we play around with a huge Southern stingray partially buried in the sand. Eventually bothered a bit too much, he ripples away from us hovering a few inches above the bottom. Linda and I both get chilled after 65 minutes in the water, despite the 80°F temperature. It's been a great morning dive. Back at the condo, Linda, Myron, and I decide to head into town to get some surface time and to warm up. Linda and I are interested in doing a bit of cycling, but unfortunately the bicycle rental place is closed for another 30 minutes. Myron hikes across the street and into the Bonaire Art Gallery and strikes up a conversation with Sylvane, a windsurfing instructor. After a few minutes, we sit down together with Sylvane and he readily convinces us to take a windsurfing lesson on Sunday. We make an appointment to meet him at 10AM at the art gallery. Cool! Around 2:15PM, we head over to the Cycle Bonaire shop and rent two mountain bikes. The rental comes complete with helmet, tire kits, air pump and water bottle filled with ice. The shop technicians take care to adjust the bicycles to our body sizes and make sure we understand all the operational features. It is a pleasant and attentive service. Cost of the rental is very reasonable at $15US/day. Myron returns to the condo in the minivan while Linda and I head off through the streets of Kralendijk on the bikes. Starting out on Kaya L. D. Gerharts we head east past Cultimara Supermarket. The mountain bikes are quite easy to ride although they require more pedal power than do our normal touring bikes at home. The streets of Kralendijk are not well suited for bicycles, providing little or no room on the shoulders, but at most times of the day the traffic is so light that the riding lanes are comfortable. The sun is hot and the air is fairly humid as we continue east on the highway out of town. There is a slight headwind which increases our labors. Still, it is a wonderful feeling to be pedaling out in the wilderness of a foreign land, looking for sights, choosing our road. In a short time, we arrive at a "Y" junction, where the paved road veers south. We select the unpaved road that continues east and soon find ourselves in pasture-like lands speckled with scrub bushes, chickenwire fences, scraggly trees, and patches of marshland. We soon glimpse a pair of wild donkeys warily eyeing us, then small bands of goats. On our right, the patches of marsh expand into swampy backwaters, and we see large dispersed gatherings of flamingos tromping about in the shallow waters. These waters are a part of Lac Bay, a world renowned windsurfing destination. As we continue up the rutted dirt road, we pass a stucco residential building on our left labeled on one side as a taco shop. We pause several times as squawking parakeets jet by overhead. After about 70 minutes of steady pedaling into the hot wind, we finally arrive onto the opposite side of Bonaire, and the road turns parallel to the beach. We stop and dismount to explore the beach. 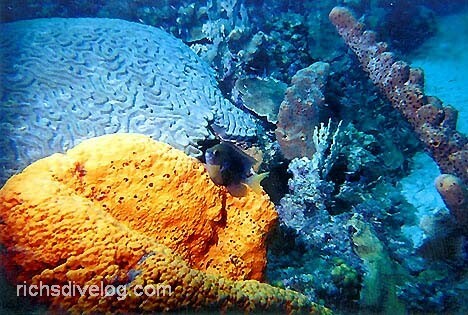 It's covered with white pieces of coral rubble stained with black and pinkish hues. There is a strong wind gusting directly inland, and the wind-driven waves crash in from the ocean. There are several very curious structures built from scrap wood and palm sticks on the beach, similar to a lifeguard stand or maybe something ceremonial. We are the only people around as far as we can see. We continue on our bikes, and the dirt road curls around to the south. It takes us past the Cai dive site, marked by another yellow stone. The waves and surf are tremendous here - a dive entry and exit would be very tricky under today's conditions. The road snakes through a dense collection of trees, cuts westward, and emerges onto another beach located on the shores of Lac Bay. The large waves from the ocean seem to even out almost miraculously at the bay's inlet, and the bay is a gorgeous shimmering flat of turquoise and deep blues. The road ends at this beach clearing, and a half dozen dwellings are located here. There is a larger building labeled as the "Weekend Bay Bar" complete with tables and a thatched porch roof, but the bar apparently is not open. Beside the building and next to the beach, there are several amazing piles of conch shells nearly 20 feet high. A site of great feasting and partying no doubt. One or two locals are visible, watching soccer on the bar television. Otherwise the clearing is quiet. After a rest, we start the return trip and find the going much easier with the wind at our backs. The wind direction serves as our beacon as we decide which turns in the road to take. Emerging onto the paved road, we find ourselves back in Kralendijk in short order, and we then negotiate the winding town roads, following Kaya Gobernador N. Debrot north, and we finally return with the bikes to the Sand Dollar. The ride totals about 16 miles, but has been an effort in the heat and winds of Bonaire. Linda elects to take a siesta while Rich flips on the television to check out a World Cup consolation match. Myron fixes rum punch slushies for all, and we sample one of the weird Dutch beers, too. The Amstel Malta is really strange stuff, sort of syrupy sweet and yeasty, maybe not alcoholic. When Linda emerges, we take some time to enjoy the sunset on the beach wall. We discuss and then settle on Mi Poron as our restaurant of choice for the evening. Mi Poron is listed in various tourist books as a server of true Bonairean cuisine. Jumping into the van, we locate the restaurant slightly northeast of Kralendijk. As we enter the establishment, we walk through a quaint old house full of Bonairean artifacts from days gone by. We are seated outside in a courtyard beneath several beautiful old trees. There is a baseball field not far from the courtyard with a game in progress. It is a fabulous night in paradise with friends and a few mosquitoes. The stobá is the mouthwatering choice of the day, the Bonairean word for stew. Linda and Myron select the conch stobá while Mercedes and Rich go for the goat stobá. We find the goat delicious, not unlike the rich flavors of oxtail stew.